Brain waves change with age, sensory stimulation, brain disease an the chemical state of the body. EEG’s are used for research on sleep and for diagnosis of epilepsy and many types of brain lesions. If the brain waves are too fast or too slow it is noted that the cortical cerebral function may be interfered with. EEG can also help in the diagnoses of traumatic brain injury. They use a scale to determine the severity of brain injury from mild to severe. 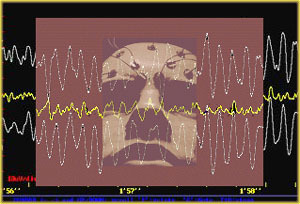 Brain waves are always present even during unconsciousness or coma. If they are not present it is consider a flat EEG and brain death. EEG is a real time test so its diagnostic value is weak, especially when looking for subtle seizure activity. is only sensitive to brain abnormalities which occur while it is being administered. is rarely positive in MTBI or concussion cases. is intended to be diagnostically sensitive for seizures. Yet because it only give a report of what happened while “under the hood,” so to speak, it misses most seizure activity.